The final day of Paolo Ceppi’s Thailand Giant Snakehead fishing trip saw him making an early start after a light breakfast on his floating bungalow. 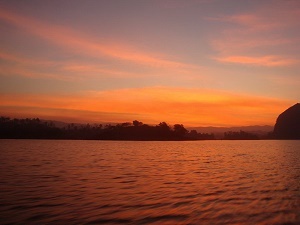 After boarding the longtail boat the Italian angler was soon rapidly powering towards the first fishing spot of the day. As the fishing boat neared a sunken forest in a quiet corner of the dam the captain halted the motor and slowly paddled the last few yards in silence. The Italian angler wasted no time in casting his replica frog towards the potential holding area and slowly teasing it past the underwater snags. On the third retrieve past the sunken forest the lure was savagely hit by an unseen predator causing the angler to firmly set the hook with a lightening fast strike. A short but spirited fight ensued which saw the angler applying maximum side strain with the rod to keep the Snakehead out of the danger area. A few minutes later Paolo swung a small Striped Snakehead into the boat of approximately 1kg. After returning the Striped Snakehead the angler continued methodically searching the area with a series of casts but no further action followed. The day passed relatively quickly seeing the angler fishing at various parts of Khao Laem Dam in search of the ever increasingly elusive Giant Snakehead. With conditions not the best with low water levels and extremely hot and dry weather conditions Paolo persevered and continued to cast a variety of lures in the hope of more toothy predators. Towards the end of the days Snakehead fishing after casting a smallish subsurface lure towards some sunken structure the lure as violently grabbed by an unseen predator. After a short lively battle a small Giant Snakehead was brought alongside the boat before being gently clasped with a boca grip and brought into the boat. The Giant Snakehead only weighing a mere 1.25 kg was quickly photographed before being released back into the dam. Paolo managed to land one further Striped Snakehead before the days snakehead fishing ended of a similar size to the last. 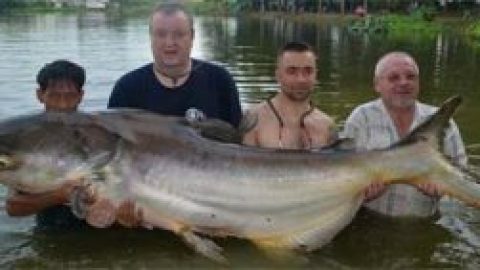 Although Paolo failed to catch any particularly large Giant Snakehead on this visit to Khao Laem Dam, the Italian did manage to average three to four takes per day during his snakehead fishing trip. 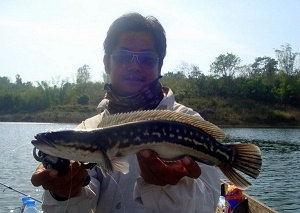 The extremely hot weather and low water levels at the Dam seemed to keep the Giant Snakeheads from feeding in earnest during the snakehead fishing trip but did not hamper sport with their highly aggressive cousins the Striped Snakehead who savagely attacked anything that was cast at them.